First I want to say Happy Valentine's Day all of you beloved Craftside readers! Yesterday I shared with you about the Vintage-Inspired, Modern Style Design Challenge and today I have a super special giveaway to share with you! Indygo Junction has offered you Craftside readers the chance to win your choice of any Indygo Junction pattern! Here is just a few. They have patterns for everything from cute dresses to fun accessories and ornaments! What sewing technique have you either recently mastered or is next on your list to try? Leave your answer in today's comments by Midnight ET on Tuesday, February 21, 2012 and you will be in the running. 2 commenters will get to choose 1 each of the Indygo Junction patterns. ANd for two more chances to win a free Indygo Junction pattern pop on over to this post at Recycled Crafts at Craft Gossip and leave a comment there! And speaking of sewing techniques here is a great tutorial on how to mark the perfect placement of a button to a buttonhole from the book Singer® The Complete Photo Guide to Sewing - Revised and Updated Edition. Click on this page from Singer® The Complete Photo Guide to Sewing - Revised and Updated Edition to enlarge and read how to mark the placement for a button so it lines up perfectly with a button hole. This is the one reference every sewer needs. Its 352 pages and 1,200 photographs cover every aspect of fashion and décor sewing. Sewers from beginners to the skilled will turn to this book again and again! I have a big cool Design Challenge to tell you about today! Amy Barickman has partnered with SINGER® and Coats & Clark to bring you the Vintage-Inspired, Modern Style Design Challenge. BurdaStyle will be hosting the challenge on their website (www.burdastyle.com/vintagemodern). This challenge was created to celebrate the history of sewing by recognizing both SINGER® and Coats & Clark, who are both celebrating significant anniversaries this year (160th and 200th, respectively), as well as to educate and inspire through the life and work of Mary Brooks Picken, the authority on fashion and dressmaking in the early and mid-1900s. See Mary’s connection to both SINGER® and Coats & Clark in this video that explains the whole challenge and the fabulousness you can win! Mary’s work is the basis for Amy's book Vintage Notions. Be sure to view the new Vintage Notions video on AmyBarickman.com. It shares Mary’s history and dives deeper into the projects, departments and materials you will find within its pages. This challenge is an opportunity to encourage fashion enthusiasts to use their sewing skills and creativity to make a wearable fashion project. The deadline for submissions is Monday, March 12th, 2012 at 11:59 pm (EST). The winners will be announced Monday, March 26th. 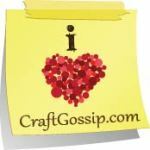 Amy also asked me to share with you Craftside readers the code VMCB for 20% off a one-time order on her website. Just add items to your cart, enter the promo code VMCB and click update cart!! Learn how easy it is to create some great textured fabrics by adding simple hand-sewn tucks! Eileen made a hybrid Valentine's Day card inspired by a book she just read, I Heart Stationery by Charlotte Rivers. The yarn shortage is over, and the Crafty Princess can show off a baby afghan she made for a donation drive she is running for Healthy Start. Are you interested in writing and selling your sewing, quilting, knitting, crochet, or other craft patterns? Check out these tips and share any of your own. At the Summer CHA Craft SuperShow, Singer provided two Singer Confidence sewing machines as prizes. I had the pleasure of presenting one of the machines to the winner Maureen B. from Joliet at the show in our booth! The winner of 1,000 Poses in Fashion is Nellie. More metalcraft! Cyndi has a third book to give away this week. Hurry over and leave your comment! See how to make a recycled deer pin necklace inspired by Margot Potter's new book Bead Chic. Many kids are probably not ready for summer to end, but these back-to-school activities and crafts might help make them a little more excited for school to start. Aileen shares the cumulative of the Erosion Bundle Project she participated in way back in the fall. Peruse the art piece she created from her bundles along with the collaborative piece she participated in. Carmi finds a stack of British "Men Only" magazines and makes "great for women" magnets! Cool down this summer with a batch of Cathie's homemade peach ice cream. Peaches are in season, so they are cheap and a tasty treat! Social networks are everywhere, but is that a good thing for professional crafters? Just look at all the darling altered tin boxes created by reader Sharon. She was kind enough to share some photos to inspire us all. Check out this FREE project from Madge's new book Bead Chic and leave a comment for a chance to win a signed copy!